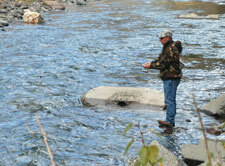 Join Sierra Adventures for a relaxing fishing expedition to lakes and streams in the Reno/Lake Tahoe area. Intro: A truly relaxing experience, designed for peace and quiet. Isolated from the hustle of the world, you can put your mind to more important issues like a German Brown waiting in that hole just across the river or a coveted Mackinaw deep in the crystal waters of Lake Tahoe. Our guide will take you to the best local spots available during a particular season. The Tour: This tour option is for beginning to intermediate angler. Your getaway starts at pre-dawn with our complimentary weather check and shuttle pickup at any local hotel. We keep it relaxed and simple. Gear is available upon request, the rest is up to you. Suggested Clothing and Gear: Extra Dry Clothes / Sun Block / Sun Glasses / Fishing License / Waders /Fishing Vest / Wool Socks / Tackle / Ice Box.